Love this set! I love a lot of the bedding from overstock. It’s so soft and comfortable. Not too light but not too heavy. Would recommend to others. Add a hint of unique style to your home with the Chic Home Ayesha 7-piece Comforter Set. This set features a soft microfiber construction in blue, yellow or black with a beautiful floral pattern and a geometric reverse pattern. 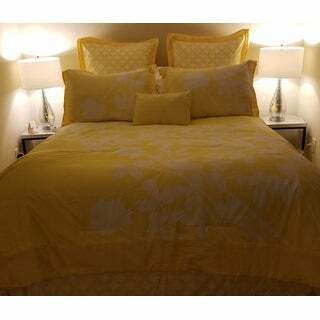 I am very happy with this comforter set, I had read one review where the reviewer said it was too small. I did not find this to be the case, I have a queen size bed, ordered the queen, the bed skirt,comforter fit as they should. I did however order the swiss lux decorator 28 x 28 euro square pillows, to fill the square shams. I recommend this product. Please note the I ordered the yellow, although the pics I posted are taken in various lighting the color is lighter than pictured. I love the relaxing theme and hope you enjoy it as much as I have. Also my place is super small, next to the beach, so location vs size, I also ordered the Christopher Knight white faux leather ottoman bench, love it too! This is such a chic set. I ordered it in the black and I absolutely love it. The comforter is super warm and definitely much better than I anticipated. Highly recommend! I was looking for a comforter that wasn't too heavy since I live in Arizona. This is a warm yet not too heavy comforter that looks very pretty. I bought the King size for my Queen size poster bed. I would recommend this comforter set. My daughter loves her new comforter set. This comforter is beautiful! I bought it for my daughter’s room and what a different it makes. Really nice quality and so beautiful. The color is true to the picture. The pattern is absolutely beautiful and has a great look. However, the comforter only have a length of 5-1/2" on each side to hang. In no way does it cover the mattress. It also is soft as can be and is great to sleep with. If it was longer on the sides, and I did purchased the king size, I would give it a 5+. Comfy but not the color I expected. Good buy overall. "I'm interested in the black/white but want to know if anyone has washed this comforter yet? How did it come out?" I washed it on cold in a gentle cycle and it came out perfect. No bunching or anything. I was surprised. "Is there a way that i can get just the comforter without getting the entire set?" Sorry, we only sell this product through a 7-Piece or a 11-Piece set. "Is this comforter warm? How heavy does it feel when lying underneath?" Hello dakini88, we can appreciate the fact you want a firsthand account of the product. You will receive an email notification every time you get a response. Thank you for shopping with us. The color and design. Looks very cheerful and bright! Like the NEW color!